The integration of wave energy converters (WECs) with floating breakwaters has become common recently due to the benefits of both cost-sharing and providing offshore power supply. In this study, based on viscous computational fluid dynamics (CFD) theory, we investigated the hydrodynamic performances of the floating box and Berkeley Wedge breakwaters, both of which can also serve as WECs. A numerical wave flume model is constructed using Star-CCM+ software and applied to investigate the interaction between waves and wave energy converters while completing the verification of the convergence study of time and space steps. 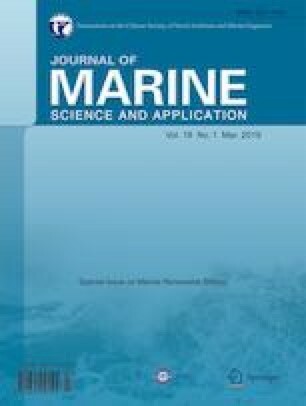 The effects of wave length on motion response and transmission coefficient of the floating box breakwater model are studied. Comparisons of our numerical results and published experimental data indicate that Star-CCM+ is very capable of accurately modeling the nonlinear wave interaction of floating structures, while the analytical potential theory overrates the results especially around the resonant frequency. Optimal damping can be readily predicted using potential flow theory and can then be verified by CFD numerical results. Next, we investigated the relationship between wave frequencies and various coefficients using the CFD model under optimal damping, including the motion response, transmission coefficient, reflection coefficient, dissipation coefficient, and wave energy conversion efficiency. We then compared the power generation efficiencies and wave dissipation performances of the floating box and Berkeley Wedge breakwaters. The results show that the power generation efficiency of the Berkeley Wedge breakwater is always much higher than that of the floating box breakwater. Besides, the wave dissipation performance of the Berkeley Wedge breakwater is much better than that of the floating box breakwater at lower frequency. • Integrating floating breakwaters with WECs has the benefits of both cost-sharing and providing offshore power supply. • The wave energy absorption ability of the Berkeley Wedge breakwater is much better than that of the floating box breakwater. • The wave dissipation performance of the Berkeley Wedge breakwater is better than that of the floating box breakwater at lower frequency. The authors gratefully acknowledge the financial support from the Lloyd’s Register Foundation (LRF) through the joint center involving University College London, Shanghai Jiaotong University, and Harbin Engineering University. The LRF helps to protect life and property by supporting engineering-related education, public engagement, and the application of research. This research was financially supported by the National Natural Science Foundation of China (51409066, 51761135013), High Technology Ship Scientific Research Project from the Ministry of Industry and Information Technology of the People’s Republic of China–Floating Security Platform Project (the second stage, 201622), and the Fundamental Research Fund for the Central University (HEUCF180104, HEUCFP201809).